Lately several friends in ministry have contacted me about taking a sabbatical. It seems we are not the only ones who have burnt out in ministry. 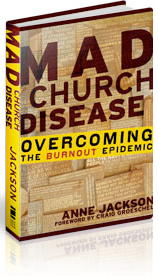 One of the best books I’ve read on this subject is Mad Church Disease, Overcoming the Burnout Epidemic by Anne Jackson. Humorous, but filled with valuable information, this book will motivate you to take that sabbatical you have thought about. Another resource I’ve passed on to others is the website of yourSabbatical.com. On January 4th, 2010, Barbara Pagano wrote a post on yourSabbatical.com about results of a study by the Louisville Institute showing the benefits of a sabbatical for both a pastor and a congregation. “Finding: A solid majority of both the sabbatical takers and their congregations report a significant, enduring post‐sabbatical strengthening of the pastor’s ministries of teaching and preaching. 94% of congregational representatives indicate that they perceived their pastor to have been refreshed or re‐energized after the sabbatical. 90% of congregational representatives believe that the sabbatical strengthened the pastor’s commitment to their congregation. These are awesome statics to quote when I encourage folks in ministry to take a sabbatical. Read the article here and then explore yourSabbatical.com for more interesting posts on sabbaticals. And check out Mad Church Disease for more great research results and information. Jackson’s book looks very interesting. Thanks for including us, Susan! The study of pastoral sabbaticals was very well done. Naturally the outcomes were astonishing and the personal journeys on the website are so interesting. The main outcome for me was a large dose of inspiration as yourSABBATICAL moves closer to a time that we’ll have a similar research study on business sabbaticals! Loved your article, Barbara and your website is wonderful for folks needing help in planning a sabbatical. Thank you to you and Elizabath for all the work you put into it.